My husband often refers to the kids’ clothing section of any store as a “pink and blue black hole” because it’s impossible for me to walk by the clothing without getting sucked into it “for just a quick look.” And, of course, it’s impossible for me to reemerge from the black hole without picking up a few adorable outfits. Our most recent visit to the local shopping center is full of black holes. The husband would disappear into the Wilsons Leather store to try on jackets that he’d find excuses not to buy, while I’d wander into the Yankee Candle store to sniff the new holiday scents. And then we walked past the OshKosh B’Gosh store, and the gravitational pull was inescapable. After years of oogling the OshKosh collection online, it was my first trip to an actual store. I bounced from rack to rack with glee, loving the sale signs that hung throughout the store. My husband knew that we wouldn’t escape this black hole without buying a few winter outfits. What he didn’t know was how many outfits we’d be able to buy without spending a lot of money. With my husband on toddler-watching duty, I was free to scamper about the store, loading up my free hand with an assortment of 4T and 5T outfits. 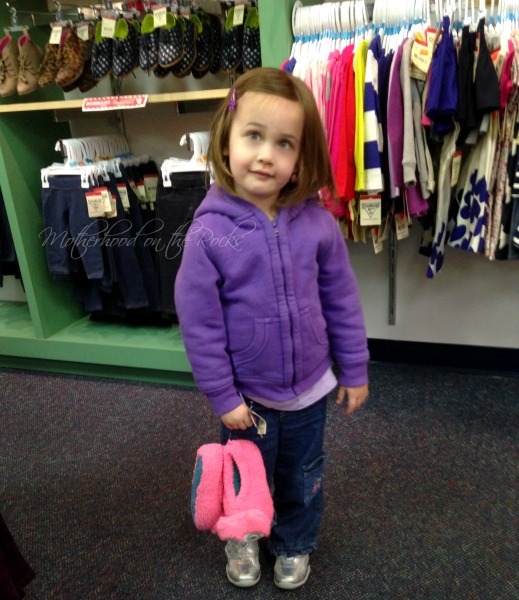 While we were there, our little Diva spotted a pair of cute owl slippers. Needless to say, they ended up in our shopping basket. By the time we left, we had purchased two long-sleeved shirts, one set of denim coveralls lined with fleece, one adorable denim dress, one pair of pants, and one jean jacket. Oh, and the owl slippers. The total was just over $100 AND we got a $10 voucher which guarantees that we’ll be making another trip in the very near future! 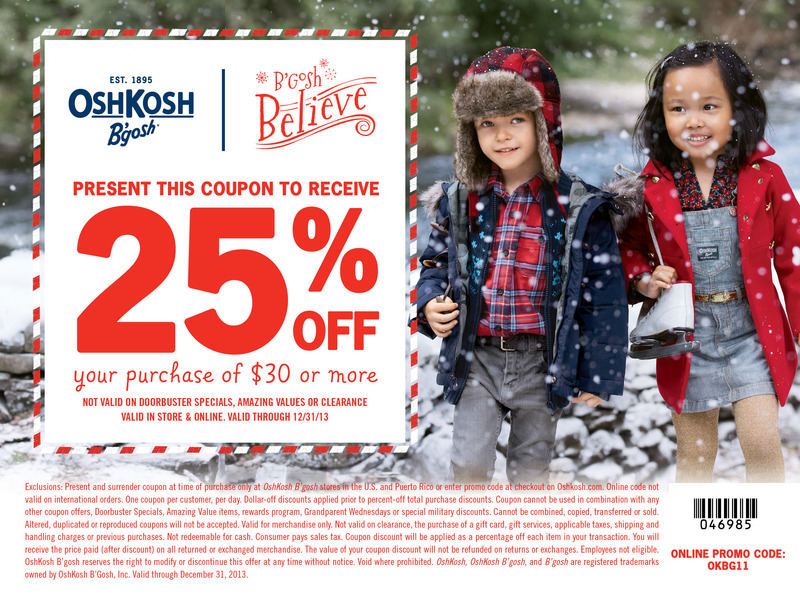 Bottom line: I definitely recommend a trip to OshKosh B’Gosh, either to a store or online. If you visit, don’t forget to print out their coupon for 25% off any purchase of $30 or more (redeemable both in-store and online). You can also follow them on Facebook and Twitter for updates, news and special offers! She is so cute! I love the owl slippers. We love Osh Kosh B’Gosh! Aw those slippers are adorable! I’ve been wondering if my 1.5 year old would wear slippers (and leave them on) – girl slippers are cute! Now i want the owl slippers for my little one! Those owl slippers are fantastic. Do they come in adult sizes? I would totally wear those on a daily basis. We don’t have a retailer in our area, but I absolutely adore their clothing! It is so cute! And it lasts a long time too! We shop online with them. I’ve always like the classic looks you can find from OshKosh. I wish there was a store near me – my shopping is confined online so far. Those owl slippers would “make” any outfit! totally cute! I love the osh kosh clothing. So cute! LOVE the slippers! Osh Kosh has always been a clothing brand I could trust for my kids. They make quality clothing at reasonable prices. I love those slippers! So cute! The slippers are super cute. I love Oshkosh and Carters. I get majority of my childrens clothes from them. Osh Kosh B’Gosh clothes are too cute and they last forever. A OshGosh B’Gosh gift card will definitely be a gift for my niece who has little ones. I looove this outfit. Your daughter makes these clothes look adorable! I love shopping at Osh Kosh B’Gosh! I can’t wait to head to the store with my coupon….thanks! Oh she looks so cute in her purple jacket… I so need that this morning its so cold here in dallas. My goodness… shut the front door, those slippers are too cute. Very fashionable indeed! Love what you picked out! I love Osh Kosh for my kids. They have such timeless items and great prices! Sooo cute! My girls would love those owl slippers! 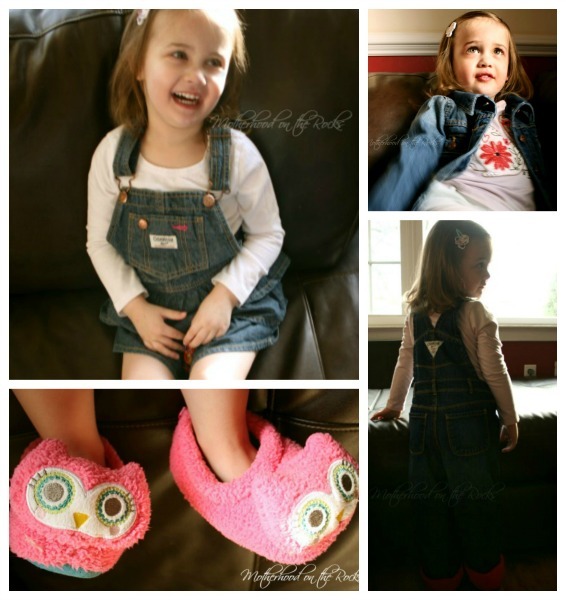 The owl slippers are a total must have for little girls! The slippers are so cute! Love them! I really like those owl slippers! They are so cute and look really comfortable. I love OG! They always have the best sales and coupons! I usually score shirts and pants for about $3 each! Those slippers are too cute! I shopped at OshKosh all the time when my kids could still fit into their clothing. OshKosh always has a great selection and their prices are awesome too. Ahh my goodness, so cute! Those slippers are the best! I am going to have to pick up a pair for my nieces, they will love those! OMG those slippers are just darling! OshKosh makes an awesome, quality product! A great brand for kids clothes. I love osh kosh! They make such great quality clothes! love the slippers! His take on the kids’ department cracks me up but he’s so right! Especially when it comes to Osh Kosh clothing! I love Osh Kosh clothing and the prices are great!! Your daughter has great taste….I love those slippers too!! very cute!!!! thank you for sharing!!! slippers look very comfy! i LOVE those slippers!! absolutely darling! When my daughter was about 3, I bought her some red corduroy OshKosh B’Gosh bib overalls. They were so cute! Wow Osh Kosh is still around after all of these years! I’m 32 and I remember wear my Osh Kosh all the time! So cute and stylish! Osh Kosh makes great products. I have never met anyone who did not like OshKosh stuff! Oh how cute! I love the clothes and the slippers are adorable. I used to always buy my kids Oshkosh when they were little they have great products. love the slippers! We shopped at this store over the weekend and got 13 articles of clothing for only $106! I LOVE OshKosh, I’ve been getting a lot of great deals from them lately! LOVE those slippers, so cute! Those owl slippers are TOO cute! We love Osh Kosh B’Gosh! Love Osh Kosh here! Very cute pics! I love Osh Kosh. I get a ton of clothes there for my kids. Osh Kosh was always a favorite for my son when he was younger. Classic, cute, durable clothes and they resell quite well when your child grows out of them! Those are some really cute pictures. Absolutely adorable. I love oshkosh – they have such adorable clothes! I used to buy OshKosh all the time. I loved the double knees and they always seemed to last long. I also think they’re timeless outfits. omg those slippers are adorable!! I love OshKosh stuff, last so long! Those slippers are way to cute! I love OshKosh! Dependable, fashionable and sturdy! Your little one is so cute! I love Osh Kosh! SHe is adorable and the clothes are great! sometimes I wish I had a girl! She is such a cutie. Love those pink slippers. We always loved Osh Kosh’s clothing, it was one of the things that could handle the abuse of my boys. I’m a frugal shopper for my son since he gets dirty and grows out of his clothes so fast but this brand has some of the cutest clothes. I love Oshkosh their clothing is such great quality and lasts a long time, unlike some other brands.